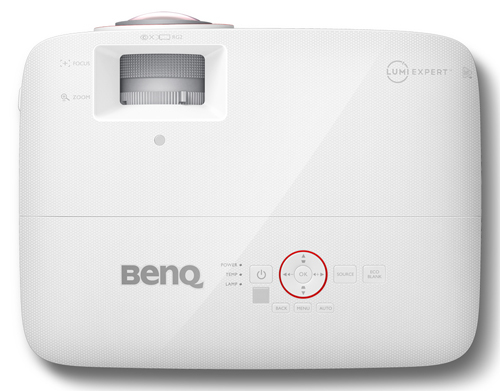 Designed with gamers in mind, the $699 BenQ TH671ST projector combines a short throw, 1080p resolution, a 3,000-ANSI lumen rating, portability, and—most important to serious gamers—a quick 16.4 ms input lag. It also delivers good color accuracy and suitable contrast for film and video, a combination that puts it in the same league for watching movies or TV as similarly priced home theater projectors. It can even handle presentations nicely. All this makes it a prime candidate for both gamers and anyone else who wants a lightweight projector for home or office, including one they can set up in the backyard for a movie night. Among the TH671ST's most noteworthy features is its 1.2x zoom, an unusual extra for a short throw. Any short throw lens lets you set up the projector close to the screen for a big image in a small room—for example, small apartments or dorm rooms. But a zoom lens adds convenience and offers greater flexibility of placement, letting you adjust the zoom, rather than move the projector, to match the image to the screen size. This is particularly welcome for portable use, where moving from one location to another means having to set up the projector each time. Portability is also enhanced by surprisingly robust audio for such a small projector. Brightness is another key feature. We measured the TH671ST at a little over 2,600 ANSI lumens, which is enough to light up a 130-inch 1.0-gain screen in moderately bright ambient light. Even its video optimized setting, at a measured 1,887 lumens, is bright enough at the same light level for a 110-inch 1.0-gain screen or a 120-inch 1.2 gain screen. 5-watt speaker delivers surprisingly robust audio for such a small projector, with enough volume to fill a large family room; five sound mode presets plus User mode. Low Lamp Mode. Compared with the full power mode, Economic mode reduces brightness by about 36%. Two other settings, SmartEco and LampSave, are dynamic power modes that are intended to lenghthen lamp life by adjusting the power level based on scene content. With a standard 100% white image, we measured SmartEco at the same brightness as Normal power mode. LampSave peaked at 1,767 ANSI lumens in Bright mode, just a touch brighter than Economic mode. BenQ says there is no noticeable effect on the image with these modes, nor did we observe any. Zoom Lens Light Loss. The 1.2x zoom isn't large enough to curtail brightness significantly at the telephoto end of the lens. You can safely ignore the potential light loss when choosing how far to put the projector from the screen. Brightness Uniformity. The test unit's brightness uniformity is 63%. Somewhat surprisingly—because short throw projectors tend to have problems maintaining uniform brightness—this is actually a better than typical result for standard throw home theater projectors in this price range. As with virtually all inexpensive home theater projectors we've tested, the brightness variation is easy to see with a 100% white or light colored image. With the projector sitting on a table, brightness is highest at the bottom center of the image, and gradually falls going up and to either side, making the upper left and right corners the dimmest. Those who are particularly sensitive to brightness variations may find this unacceptable. However the difference is hard to see with any image that breaks up the field of view. Video Optimized Lumens. Both the Cinema and Sport modes are good starting points for optimizing settings for video. Both deliver color that's well within a realistic looking range and close enough to accurate so you wouldn't know that any color is off without a reference image to compare to. However, Sport mode delivers a higher ANSI lumen measurement and brighter shades of yellow, which prove to be more accurate when comparing with a reference image. With default settings, Sport mode has a slight yellow-green shift, but it is easy to tweak for suitably neutral color, and without affecting either ANSI brightness or the brighter shades of yellow. BenQ's Color Management settings let you adjust hue, saturation, and gain individually for all six primary (red, green, blue) and secondary (cyan, yellow magenta) colors. At 1,887 lumens for the optimized video settings, the TH671ST can light up a 110-inch 1.0-gain 16:9 screen or a 120-inch 1.2-gain screen in moderately bright ambient light. Even in Economic mode, at a touch over 1,200 lumens, the projector is bright enough for a 100-inch 1.2-gain screen in moderately bright ambient light or a 110-inch screen in typical nighttime lighting in a family room. Color Preset Mode Performance. Most of the TH671ST's color modes are usable straight out of the box, even for film or video, with varying degrees of color accuracy. As with the brightest mode for most projectors, the TH671ST's Bright mode shows a slight green shift. However it is less than with most projectors, particularly those in this price range. The bigger problem with Bright mode is the loss of gradations to the point of showing a hint of posterization in demanding images. Despite that, Bright mode with defaults is our choice for the presentation-optimized setting, even for presentations that include photorealistic images. Most people will also consider it acceptable for occasional use in, say, a family room in daytime when they absolutely need the extra brightness. Vivid TV mode has a slight blue shift from neutral, which is much less of an issue than a green shift for most people, and in any case is slight enough that you're not likely to notice it without a reference image to compare it with. Cinema and Sport modes, as already mentioned, both deliver good color accuracy by default, and the best accuracy of any of the modes. Game mode straight out of the box is a little cooler than the Cinema and Sport modes, with a whiter white and skin tones that look a little too porcelain in some images. Contrast. 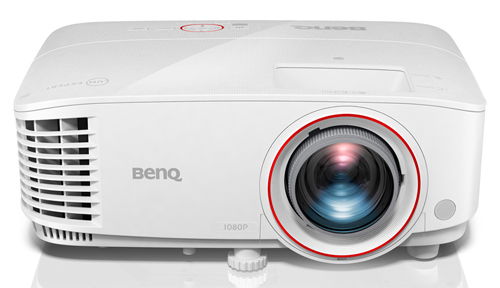 As is typical for BenQ projectors, the TH671ST test unit's defaults for contrast and brightness were set properly in all modes to maximize shadow detail and highlight separation in a dark room. The most we would change is a single step in one direction or the other for some modes, but whether it actually needs a settings change is a judgment call. Contrast, shadow detail, black level, and three dimensionality are all excellent for the price. Those seeking to to improve contrast will want to experiment with the LumiExpert feature. LumiExpert detects the ambient light level and adjusts gamma appropriately for the lighting. You can also turn it off and adjust its setting to make the overall picture a little darker or a little brighter at any given ambient light level. We found that choosing the right setting can significantly increase contrast and the sense of three dimensionality in dark scenes. Note that we saw an occasional skipped frame when watching movies at 24 frames per second (fps)—though not at 60 fps. Skipped frames are usually visible as a random, judder-like jump (only bigger) in the middle of a camera pan, or in the movement of an on-screen object when the camera is fixed. It seemed to happen more frequently with LumiExpert on, however, these skips were rare and not reliably repeatable. BenQ has been looking into the issue to determine if it's isolated to our set-up or something that might require a firmware correction. 3D Performance. The TH671ST delivers usable 3D with support for DLP Link glasses only, but its 3D performance doesn't stand out from the crowd. I saw no crosstalk in my tests, and 3D-related motion artifacts are less obvious than with earlier generation 3D projectors. However they are more obvious than with most current models. The single 3D color mode is roughly as bright as Cinema mode—the least bright 2D mode—before factoring in the loss of brightness from using 3D glasses. Rainbow artifacts. The TH671ST gets mixed results for rainbow artifacts. I saw them more often than with most current models, but they were surprisingly fleeting. If you're not sensitive to rainbows, you may not see them at all. But if you are particularly bothered or don't know if you are, consider purchasing from a dealer that allows easy returns so you can test this for yourself. Onboard audio. The TH671ST's audio is a pleasant surprise for such a small projector. The 5-watt mono speaker delivers high enough volume to fill a large family room, and the audio quality is surprisingly good, with five sound mode presets to choose from—Standard, Cinema, Music, Game, and Sport—plus a User mode. BenQ says it uses digital audio enhancement algorithms to enhance bass and treble. You may still want an external sound system—to enjoy stereo sound, for example—but for portable use or a backyard movie night, the built-in audio should be all you need. Fan noise. BenQ rates the TH671ST at 33 dB in full power mode and 29 dB in Economic mode. In either one, you can hear it in quiet moments from anywhere in a typical-size family room, but it is the sort of steady whoosh that tends to fade into the background in rooms with other ambient noise, particularly in Economic mode. BenQ recommends using High Altitude mode at 4,921 feet and above. With High Altitude on, most people will want to stay with Eco mode, which is quieter than full power mode with High Altitude off, but with a higher pitch that makes it a little more intrusive. With full power, High Altitude mode both increases volume and raises the pitch. Input lag. With Fast Mode on, the TH671ST's input lag is 16.4 ms in Bright and Sport modes and 16.6 ms in Vivid TV and Game modes. Both are fast enough for serious gamers. Input lag for Cinema mode is only slightly longer, at 18.8 ms. With Fast Mode off, the lag jumps to about 50 ms for all modes but Cinema, which is 52.2 ms. The default setting for Fast Mode is On for Game mode, and Off for all other modes. Throw Distance. Unlike most short throw projectors, the TH671ST offers a zoom lens, which adds flexibility for positioning the projector to help make setup easy. Simply place the projector at approximately the right distance from the screen, and then fit the image to the screen by adjusting the 1.2x zoom, rather than moving the projector. The range for a 110-inch 16:9 image is roughly 5.5 to 6.7 feet. The BenQ TH671ST Projection Calculator will let you find the throw distance range for the image size you want. Lens offset. The lens offset for the TH671ST is designed for placement on a low table, with the bottom edge of the image falling somewhere between the lens centerline and up to 5% of the image height above it. For example, with a 100-inch high image the bottom edge would be anywhere between even with the lens centerline and 5 inches above it. The bottom edge of the image on our test unit was about 4% of the image height above the centerline, which is within typical sample-to-sample variation. At $699, the BenQ TH671ST is an impressive gaming projector and a solid value. It delivers nicely saturated color, suitably good contrast and shadow detail for dark scenes in games, and an input lag of just 16.4 ms. 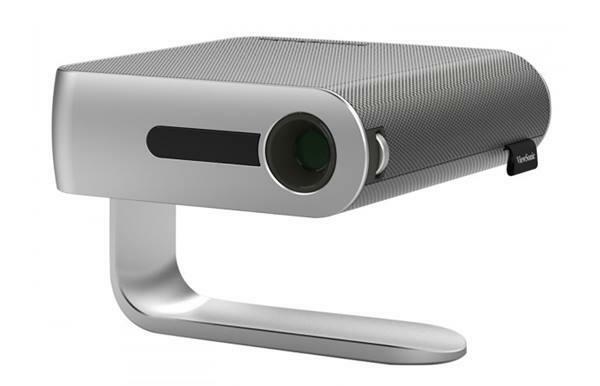 Beyond that, most of its strengths for gaming, combined with its not quite 6-pound weight, also make it a highly capable portable projector for home, office or both, with the short throw making it of special interest to anyone who is looking to project a big image in a small room. The ease of setup, thanks to the short throw lens and 1.2x zoom, along with an excellent sound system for such a small projector, are just as helpful for a portable home theater or business projector as for gaming. Even better, the TH671ST is very much in the same league as similarly priced home theater projectors for color accuracy, black level, and shadow detail, while color for animations or business graphics is vibrant and suitably eye catching. With video optimized settings, the TH671ST can light up a 120-inch 1.2-gain screen in moderately bright ambient light using full power, or a 100-inch 1.2-gain screen in Economic mode. And the LumiExpert feature can adjust gamma automatically for the current ambient light level, with a dedicated menu button on the remote so you can easily tweak its effect to taste. 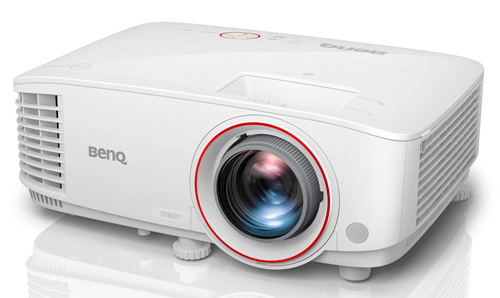 The BenQ TH671ST's combination of brightness, color accuracy, contrast, ease of setup, short throw with zoom, quick input lag, and light weight makes it easy to recommend both as a gaming projector and for broader use. It is particularly well suited if you need a portable projector, whether for carrying to the office occasionally, setting it up for a backyard movie might, or moving it room to room for movies or game playing. For any of these applications, the BenQ TH671ST should definitively be on your short list. I can confirm I also get the judder with the LumiExpert on. The judder/jump really ruins an otherwise great feature. I have to turn LE off or it is too distracting watching sports or anything with a scrolling ticker on the screen. I would love to see a firmware update to solve this issue... Come on BenQ! I'm really happy with TH671ST otherwise. I use it for TV and movies is a fairly bright space and it has enough punch to deliver a quality image. I wish the blacks were blacker when watching a movie at night, but room treatments have help quite a bit. Michael, thanks for the feedback. I've forwarded your comment to BenQ to assist them in their investigation. Hello, which will advise you between the TH671st and the Viewsonic PX706HD? Jerome, published specs are very similar on these. I'd compare our reviews carefully, or perhaps a reader with experience can share some comments. Is this Benq better than the Optoma Gt1080Darbee? It would be for mixed use PS4 games and BluRay movies. I'd use it in a bedroom and I hope I could project a 160-inch. Thanks to anyone who can help me to choose. Any possible plans to review the BenQ LK970 laser projector? I haven't been able to find a single review on that unit, but on paper it seems like it would blow away a lot of competing projectors. Nothing in the works right now, David. But we'll keep it in mind. We do have BenQ's HT9050 in our schedule, which is their new model using Philips's LED light engine. Try switching between the lamp modes. I'd guess you're on SmartEco... I've seen a little bit of the same issue when a scene is bouncing back and forth between a bright image and a dark image. I've narrowed it down to SmartEco making quick adjustments on the brightness. It's rarely bothersome, but just setting it Eco or Normal lamp modes always seems to resolve it. BenQ customer service has been awesome! They did release a firmware update to fix the LumiExpert studder and it is running smoothly.